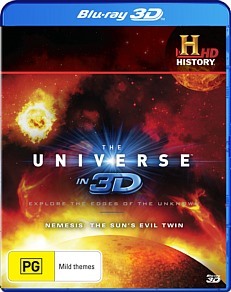 The Universe in 3D - Nemesis: The Suns' Evil Twin Blu-ray Review All in all, The Universe in 3D - Nemesis the Sun's Evil Twin is a thought provoking documentary that I could happily recommend to all lovers of astrology. The universe is a fascinating documentary series from the History Channel and best of all, this series has now been released on Blu-ray 3D which really enhances the presentation. This current release, Nemesis the Sun's Evil Twin focuses on a theory that our Solar System is actually a binary system that has two suns. Although this has not been proven and may never been proven, the majority of suns in the universe are actually part of binary systems so there is a possibility. According to some scientists and astrologers is that unlike other suns who have a similar orbit, the twin of our sun is actually on a longer orbit of around 26 million years. Why 26 million years? According to one of the scientists, this is also the time that Earth has been affected by comets which saw the end of the dinosaurs. This means that when this Red Dwarf orbits through the Oort Cloud which is a cluster of comets, it actually dislodges these comets from their orbit and sends them to our solar system. The Oort Cloud is also filled with trillions of comets. Another interesting element to come out of the Nemesis Theory is that another planet has been discovered in our solar system called Sedna which is four times the size of Jupiter and its orbit has been dislodged by something such as the twin sun. Apart from the great use of 3D, what I liked about this episode was that the History Channel used real world examples to help explain this phenomenon. For example, a juggler was used to show how a red dwarf could dislodge comets from the Oort Cloud to gymnasts on a trampoline to show how orbits can affect other orbits that is quite fascinating to watch. All in all, The Universe in 3D - Nemesis the Sun's Evil Twin is a thought provoking documentary that I could happily recommend to all lovers of astrology.